I believe this is half of the lower jaw bone. Given the wear on the jaw, this wasn't a young animal when it died. I found a jawbone but didn't know it was a deer bone. When I saw your bone it looked just like mine does. we found a deer's lower jaw bone with a baby tooth still clinging over the adult tooth at a camp on the scout leaders private property and were told we could keep it. We found a jawbone at Western Regional Park, Glenwood MD, by the play area. We weren't sure what it was until we saw your picture. 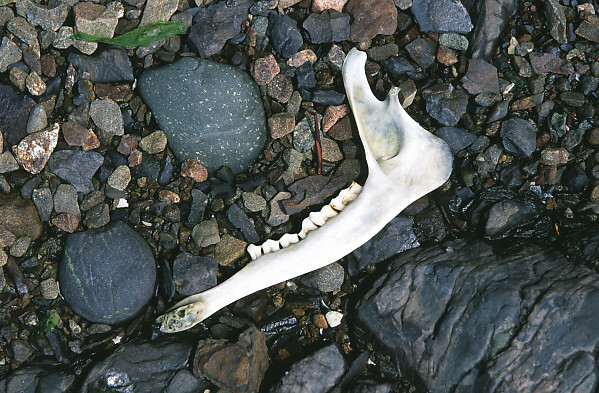 While visiting Bar Harbor ME we went Seal Harbor and walked on the beach looking crabs and shells, I found a jaw bone. We figured out it was the jawbone of a deer (gender unknown).